The Tellabs 8800 series of multiservice routers are designed to help you converge and consolidate network architecture while maintaining a core network and carrier-grade service offerings. Get the smart routing and switching functionality you need across a wide range of network protocols and deployments. And you can give yourself the largest support at the smartest price when investing in core and provider edge support by choosing the Tellabs 8860 MSR. Boost your mobile backhaul, convergence of fixed and mobile environments, improvements to legacy networks and support for legacy migration plus improvements to carrier Ethernet service offerings. 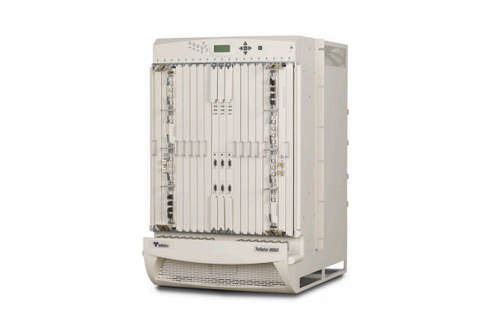 The Tellabs 8860 MSR is a 19-slot chassis that can work to deliver business-class IP and carrier-grade Ethernet services. One of the chief benefits of the Tellabs 8860 MSR is its ability to support services from Layer 1 to Layer 3 on a single platform, so you’ve got strong flexibility that works across any channel and any port. Bridge multiservice interfaces from IP and MPLS to ATM, FR and even pseudowire circuits and link aggregation. Its universal line card slots give it the functionality to support packets, cells, TDM circuits plus Ethernet and SONEY modules simultaneously. Worldwide Supply makes that functionality and breadth affordable with used and refurbished Tellabs 8860 MSR models brought up to OEM standards but at a fraction of OEM rates. Enhance your network with up to 320 Gbps switching capacity at a cost that feels closer to MSRs that can only handle 80 Gbps when you select a used Tellabs 8860 MSR from Worldwide Supply.